Managing your roof can be difficult, especially from the ground level. Keeping an eye on the condition of your roof is a nearly impossible task for some homeowners in the Sydney area but it does not need to be. With a little help from our Gorillas, you can monitor the overall condition of your property safely, with your feet planted firmly on the ground. The community of Sydney and Nova Scotia as a whole is a prime environment for roof clutter and moss growth. Moisture, shade and plant life are all contributing factors to the build-up of clutter and Sydney has these in spades. There is always some presence of moisture on your roof, but having organic debris or clutter can hold on to even more than usual. An increased amount of moisture can increase the chance of moss spreading across your roof. From afar, moss might not seem like the most frightening plant life around but it can cause a lot more damage than it lets on. On of the biggest threats facing your home or business in the Sydney area is moisture. Moss retains dampness and uses it to spread. As this growth spreads, it moves over and under shingles, reaching the more sensitive areas of your roof. As decking is softened, it can wear away, leaving opening for water and other material to reach the interior of your space. Going up against nature can be difficult, but our Sydney roof cleaning and moss removal sets you up for success. After that, it is all just regular maintenance to keep your property looking great all year long. One of the most obvious negative effects of roof clutter is the visual appeal. Whether you are thinking about selling a property or entertaining visitors, your roof will not go unnoticed. 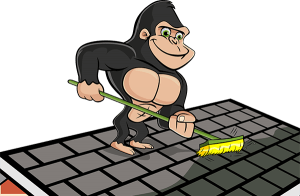 By choosing our Gorillas for your Sydney roof cleaning and moss removal, you are saving yourself the struggle of getting up on the roof and causing potential damage. Our Gorillas are always insured and highly trained in all the right safety protocols. In addition to working safely, our Gorillas provide before and after photos to show clients just how well we work. Just because you are safely on the ground, does not mean that you can’t have a birds eye view of your service.